Bezenye/Bizonja/Pallersdorf is a village in Győr-Moson-Sopron county. 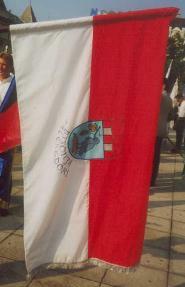 Photo taken by me on 17th August 2001 at "General County Meeting" in Győr. Coat of Arms can be seen at <www.c3.hu/~begyeuklub>. "The name of the village in Croatian is Bizonja. The settlement has been inhabiteed since the age of the Roman Empire. Teutonic graves from the period of the great migrations were opened up near the village. After the conquest [of the Hungarians] Pechenegs settled here and they later became Hungarians. Turkish troops burned down the village. The population of the village radically reduced by war, was replenished by Croatians fleeing the Turks. Before 1848 the village had a statute labour system. The village has a population of 1663 persons. 80% of the inhabitants are Croats. They keep their language and tradition alive with help of the Jorgován folk chorus and the Bizonci folk dance ensemble. Important sights of the village are the Croat country house, the Roman Catholic church, the "plague columns" at two ends of the village, and the statue of Saint Stephen."